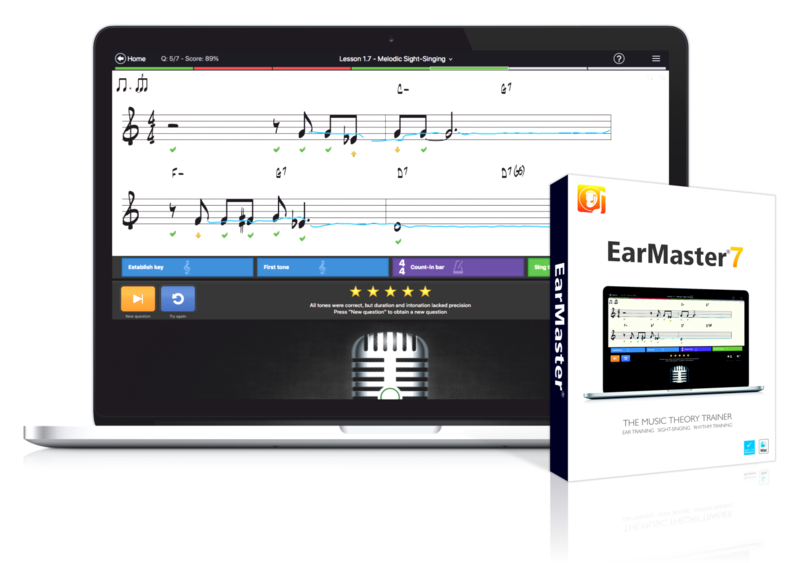 * Notice that to assign courses dynamically as shown in the video, your school needs a EarMaster Cloud license or a EarMaster 6 Lab Pack, which include both EarMaster Teacher Edition (for the teachers) and EarMaster Pro (for the students). EarMaster includes over 2000 exercises ranging from entry level to advanced level. The exercises are arranged inside 2 courses (standard and Jazz) in a linear way from low level to more advanced. EarMaster’s main user-base is college, university and music school students, so the majority of the exercises are for higher-level ear training. A rough estimate could be 35% entry-level and 65% high level. Most of the exercises are introduced by instructions, theoretical background information, and audio examples. These can be fully customized by teachers when used in an educational setting. The documentation of the software offers brief tutorial instruction about intervals, scales, chord progressions, chord inversions and swing rhythms, as well as a series of practical advice for efficient ear training sessions. A very comprehensive list of songs that students can use as references for interval recognition is provided at www.earmaster.com/intervalsongs. Each song is illustrated by a YouTube video. Add items to the exercise (intervals, chords, scales, rhythmic values, keys, introductory cadence, etc.) 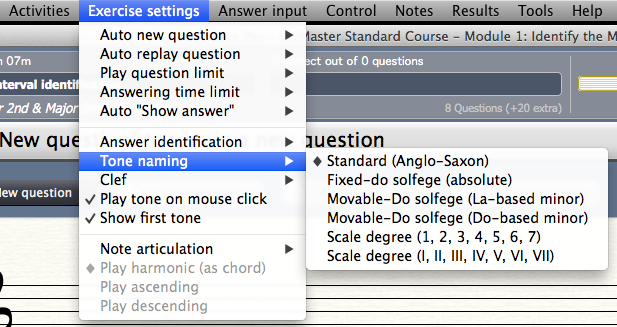 for questions generated by the program, or select specific melodies from the built-in melody library of EarMaster (MusicXML files can be imported in one click). 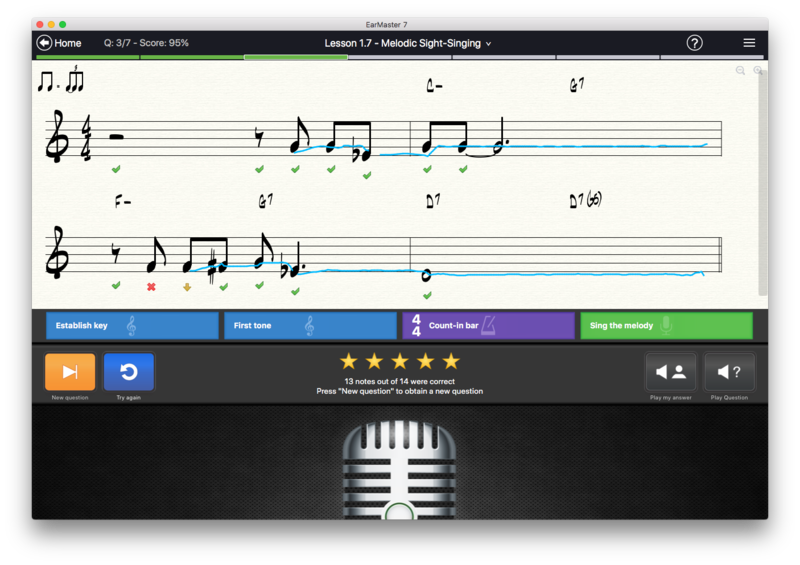 Notice that custom chords, scales and progressions can be added to their respective libraries and used in EarMaster exercises. By using menus and toolbars available anywhere in the program to change the tone naming system, the tone range of the questions, answering time limits, visual interfaces, etc.